President Moon Jae-in’s constitutional amendment bill was scuttled Thursday, after voting at the National Assembly was declared void as the quorum could not be reached due to the opposition parties’ boycott. Amid public calls to revise the Constitution that was last amended in 1987, the Moon administration announced and submitted its amendment bill to the National Assembly on March 26. Thursday was the legal deadline for lawmakers to decide whether to accept or reject the proposal. National Assembly Speaker Chung Sye-kyun convened the plenary session at 10 a.m., but only 114 ballots were cast, falling far below the quorum of 192, which is the required two-thirds of the total 288 lawmakers. 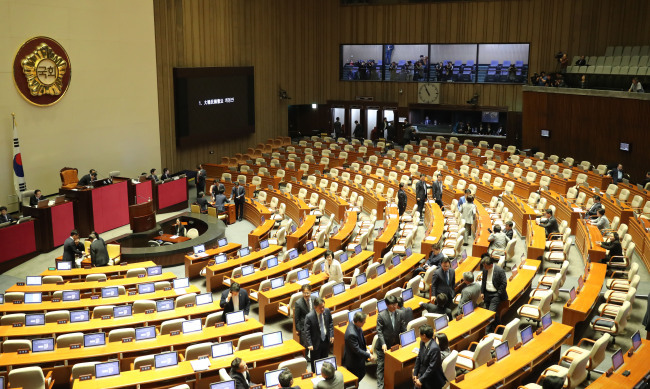 The main opposition Liberty Korea Party boycotted the plenary session as a whole, while members of other parties did not cast votes although they attended the session. The rival parties have been clashing over the presidential proposal, with the opposition parties demanding the government withdraw its own bill. They had expressed concerns that if the bill is voted down, they would be seen as going against the plan to amend the basic law. The ruling Democratic Party of Korea, however, insisted it is a legal procedure stated in the Constitution that lawmakers should follow as their duty. The presidential office also did not retract its proposal and demanded the parliament make a decision. According to Article 130 of the Constitution, the National Assembly should hold a vote on the constitutional amendment bill within 60 days after its submission, and at least two-thirds of the lawmakers should approve in order for it to pass. The presidential office expressed regret and offered a dim outlook for future discussions on constitutional reform. “The opposition parties neglected their duty imposed by the Constitution. I cannot but call it a dereliction of duty. We have missed a golden opportunity to amend the basic law,” Cheong Wa Dae spokesman Kim Eui-kyeom said. Rep. Choo Mi-ae, chairwoman of Democratic Party of Korea, also criticized the opposition parties. “Opposition parties have neglected their duty to follow the legal procedure to vote on the president’s bill today. They have just proved they only act for their political interests,” Choo said in a party meeting. “The government and the ruling party knew for sure that the amendment bill would not pass at the parliament, but pushed to put it to a vote. The sincere requests from the four opposition parties have completely been ignored,” Rep. Shin Bo-ra, spokeswoman of the conservative party, said in a statement, adding the party promises to present a bill before the end of June. Moon’s proposal is now expected to be scrapped, as there are no legal grounds that allow for the same proposal to be introduced at a plenary session again. All parties had agreed that it should be the National Assembly that comes up with an amendment bill, and a special committee was created last January to discuss it, but they have so far failed to reduce their differences on details of the revision. 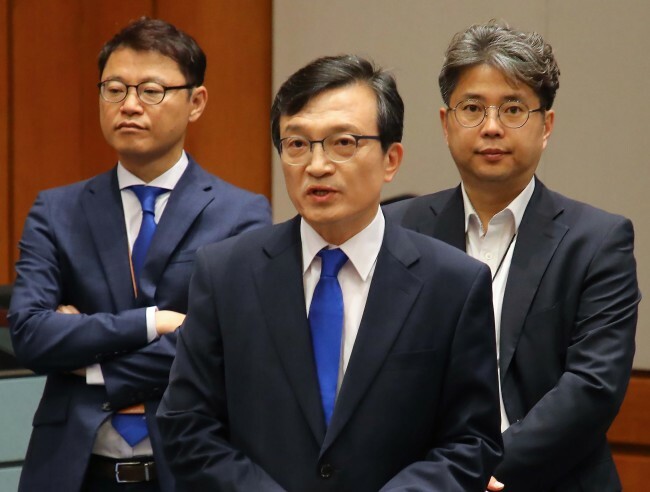 Minor opposition parties -- the center-left Party for Democracy, center-right Bareunmirae Party and far-left Justice Party -- have formed a joint group for constitutional revision and called on the two major parties to form an eight-member committee to negotiate an amendment bill. The special parliamentary committee for constitutional reform is to be dissolved at the end of June.